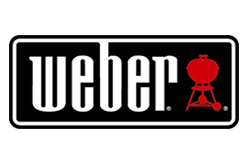 Weber is a name that is synonymous to BBQ. Their grills can be found in numerous backyards across the country and around the globe. And it’s not hard to see why. The Weber brand has certainly proven its worth over the years. The company’s grills cook beautifully and literally last for decades, often getting passed down from one generation to another. It also doesn’t hurt that they’re very easy to use. And the icing to the cake? Weber provides excellent customer service and support. Whether it’s charcoal, gas, or electric, BBQ fanatics and beginners alike almost always choose a Weber as their grill of choice. 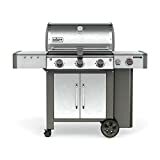 Now, as a global leader in the barbecue industry, Weber definitely has a lot of grills in its line-up for the average Joe or Jane to choose from. While everyone will tell you to just get a Weber (because they certainly are worth it), the question still remains: which Weber grill is the one for you? That’s a tough one to answer so we’ll try to help you out. Below are five Weber grills that are our top picks for your next backyard BBQ. The GS4 high performance grilling system sets a new standard in the world of backyard cuisine, & Lands the Genesis II LX in a class of its own. This innovative grilling system is based on over 30 years of grilling experience, culinary expertise, & most importantly, avidly considering the wants & needs of the people who matter most – the grilling community. 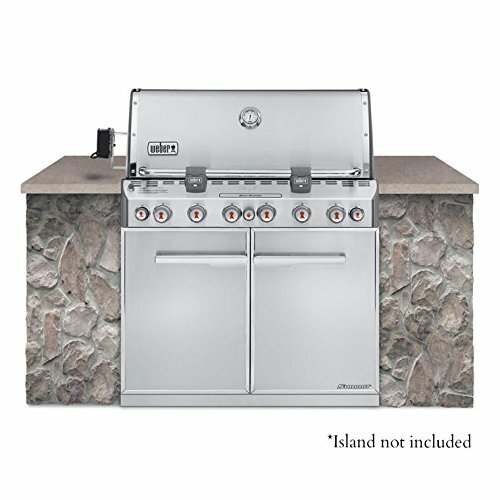 each component of GS4 was uniquely designed for ease-of-use & to provide an unequaled satisfaction to your backyard grilling experience. Promising burners that are ensured to ignite every time, smoke infused food that grills evenly & consistently regardless of where it's placed on the cooking grate, & hassle free cleanup; you are able to focus on what it’s is all about – bringing people together around the grill. 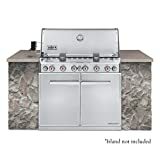 the GS4 grilling system is composed of four key components: the Infinity ignition, high performance burners, Flavorizer bars, & grease management system. These components ensure that every aspect of your grilling experience is easy & reliable; from the moment the burners are lit to the general maintenance of your grill. 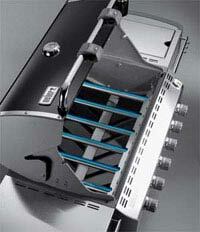 & together, create the strongest grilling engine within this Genesis II LX grill. Add flavor to the menu with a Spirit E-310. It’s the ideal grill for entertaining a small crowd or a perfect solution to any family meal. Place serving trays and spices on the side tables so that everything you need is where you are, when you need it. With features such as porcelain-enameled, cast-iron cooking grates that retain even heat, you’re guaranteed the best tasting food. It’s built to last with a cookbox that won’t rust or peal over time and conveniently equipped with six tool hooks for easy accessibility of grilling tools. If that wasn’t enough, the low maintenance and easy-to-clean grease management system takes the hassle out of cooking. 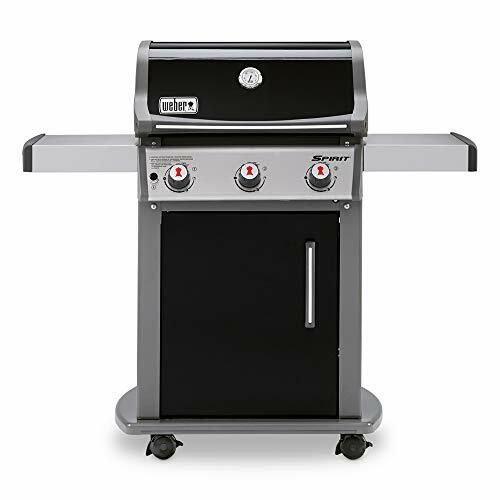 As part of the Summit S series, the S-620 gas grill has a front-mounted control panel with six stainless-steel burners and a Snap-Jet individual burner ignition system. The unit provides stainless-steel cooking grates, stainless-steel Flavorizer bars, a 60,800 BTU-per-hour input, and 838 square inches of total cooking space, which consists of 693 square inches of primary cooking space and a 145-square-inch warming rack. 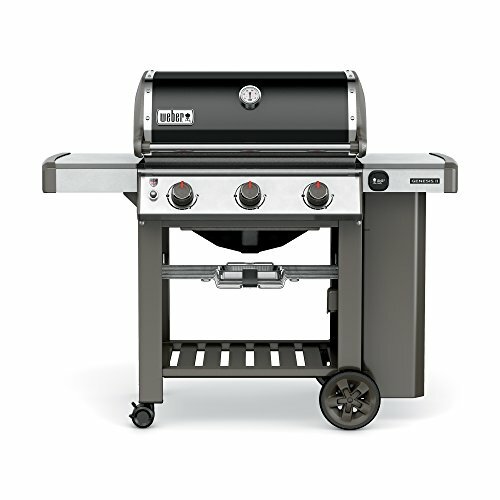 For added versatility, the grill supplies a 12,000-BTU side burner--great for sauces and marinades. 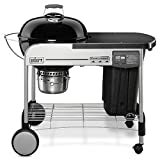 Other highlights include an enclosed cart, a stainless-steel shroud with a built-in thermometer, two stainless-steel work areas, two Grill Out lights, six tool hooks, two heavy-duty front-locking casters, and two heavy-duty back swivel casters. 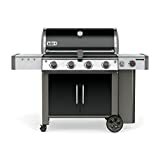 Designed for use with natural gas or a 20-pound LP tank (sold separately), the gas grill measures 30 inches long by 74 inches wide by 57 inches high and carries a five-year limited warranty. A 10-foot flexible hose for natural-gas installation comes included. Note: Images shown above are of the Weber Summit S series and E series in Black; features illustrated vary by model. The GS4 high performance grilling system sets a new standard in the world of backyard cuisine, & Lands the Genesis II in a class of its own. This innovative grilling system is based on over 30 years of grilling experience, culinary expertise, & most importantly, avidly considering the wants & needs of the people who matter most – the grilling community. each component of GS4 was uniquely designed for ease-of-use & to provide an unequaled satisfaction to your backyard grilling experience. Promising burners that are ensured to ignite every time, smoke infused food that grills evenly & consistently regardless of where it's placed on the cooking grate, & hassle free cleanup; you are able to focus on what it’s is all about – bringing people together around the grill. the GS4 grilling system is composed of four key components: the Infinity ignition, high performance burners, Flavorizer bars, & grease management system. These components ensure that every aspect of your grilling experience is easy & reliable; from the moment the burners are lit to the general maintenance of your grill. & together, create the strongest grilling engine within this Genesis grill. 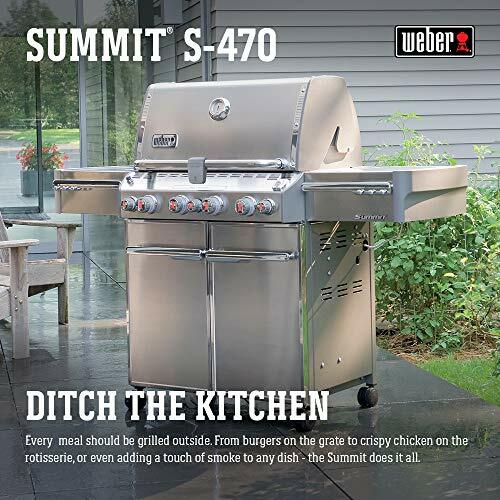 Weber Summit S-660 Built-In LP Grill Stainless Steel comes with six stainless steel burners and 769 square-inch of cooking surface. This is probably the most popular outdoor grill ever. The design is still the same one that we’ve all grown familiar with while we were growing up – the iconic kettle. It just has a few added features to make it extra nice. Originally introduced in 1952, the Weber Kettle is well-loved by many a griller simply because of its excellent grilling performance (on anything, from meat to fish and veggies), simplistic design, and its ability to last forever, creating memories that are passed on from one generation to another. 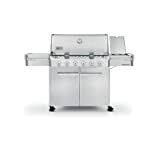 In fact, the start of outdoor grilling as an American pastime is often associated with the invention of this particular grill. Decades later, it’s still the number one choice for people who love to hold backyard barbecues. So, let’s get to the specifics on what makes this particular grill an amazing choice whether you’re a grill master or a newbie. Well, we all know that charcoal is messy and it’s a pain to clean the grill afterwards. One of the latest innovations done to the Weber Kettle is to add an enclosed ash catcher at the bottom which, as the name suggests, catches the ash and makes sure they don’t get blown away by wind. You also have an ash sweeper equipped with a handle. By moving the handle side to side, any ash at the bottom of the grill will be swept into the ash catcher which can easily be removed for a quick and painless disposal of ash. To make things even more convenient, the grate is equipped with a hinge on both sides so you can put in more coal when necessary without having to move the food. Another feature added for convenience are the tool hooks placed on the side handles. For added safety, the lid handle is made of nylon and there’s even a heat shield to prevent the handle from getting hot. What about capacity? The Weber Kettle Premium can cook as many as 16 burgers at a time, perfect for those who have a large family or wish to hold barbecue parties for their friends and neighbors. Now, to the best part. We’ve already mentioned that the grill can cook anything beautifully. And it’s certainly true. 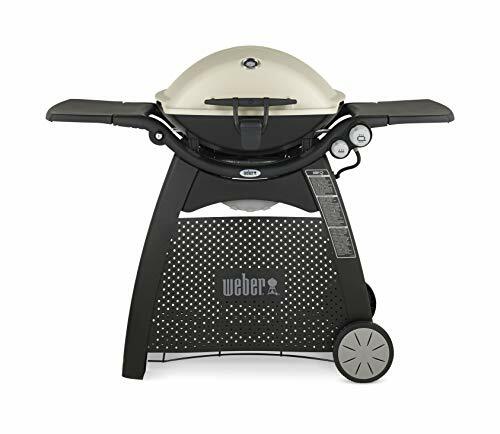 With the Weber Kettle, you can use the entire grill for hot dogs and burgers or set up 2-zone cooking for grilling and searing steaks, etc. You can also perform some delicate grilling with fish. With some practice, this particular grill is able produce delicious smoked meat. The verdict: It’s safe to say that there is a lot of truth to the reputation of the Weber Kettle. It certainly revolutionized backyard grilling. If you’re in the market for a top quality charcoal grill for under $200, this is definitely the grill for you. Double walled and air insulated. What does this mean? Double walls mean that you get the heat retention of a ceramic kamado-style grill, enabling your Weber to hold a target temp steady for a long period of time without the heavy weight. Air insulated means that it is more agile in switching between temperatures whenever necessary (such as when you overshoot your target temp) – something that is quite difficult to do with a kamado-style grill. 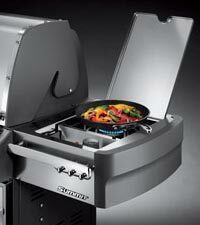 The cooking surface is 24” in diameter which means that you get 25% more cooking space than the original Kettle grill. The movable charcoal grate enables you to place your coal nearer or farther from the food so you can enjoy medium temperature grilling, scorching hot grilling, and even improved searing. The hinged cooking grate plus the movable charcoal grate makes it easy to replenish coal. 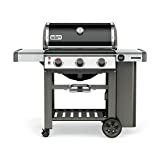 The cooking grate also features Weber’s Gourmet Barbecue System which is a removable insert that can be replaced with various accessories such as a pizza stone, griddle, sear grate, and wok. 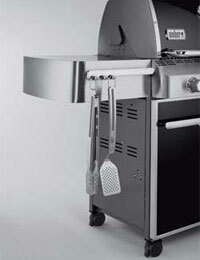 Features a “Rapidfire” lid damper found on top of the lid works similar to other disc-shaped dampers found in Weber grills. The innovation here is the hinge that allows the damper to be flipped open for maximum exhaust. This means that you spend less time lighting up the coals and bringing it up to the target temp. 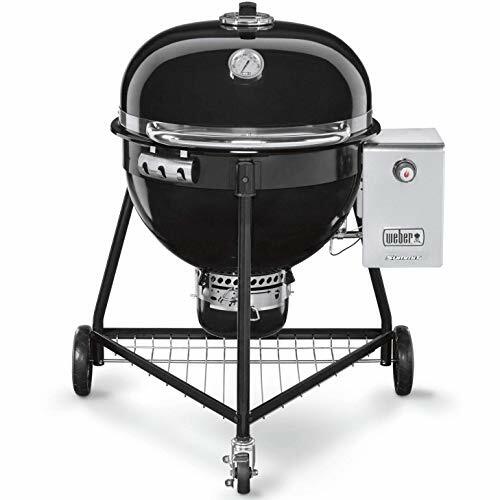 The Snap Jet Gas Grill Ignition System enables you to light up your charcoal within 15 minutes (less if you place the grate in the lower position). Comes with a hinged diffuser plate that blocks radiant heat and ensures even temperatures for slow cooking (such as smoking). The hinged sides enables you to easily add more charcoal and stoke the fire. 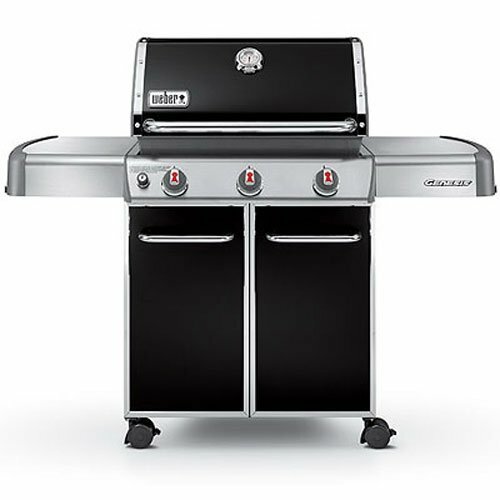 Like their charcoal grills, Weber’s gas grills are simply the best. They cook beautifully, look good, and are built to last a long time. 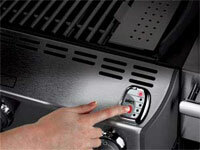 One of the most popular gas grills in the US is Weber’s Genesis series. 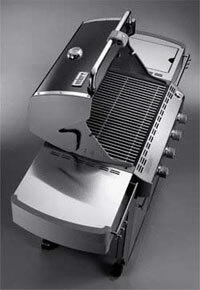 The most basic one in this mid-line series is the Genesis E-310. 3 stainless steel main burners that are lined up from left to right with a total of 38,000 BTU. 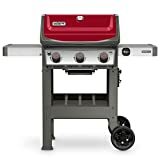 If you’re looking for a gas grill that’s well-built, efficient, and will provide you with a superior grilling experience, the Genesis E-310 is the one you should invest in. If you’re looking for a dedicated smoker for your backyard barbecues, you can never go wrong with the Weber Smokey Mountain Cooker. 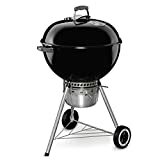 This bullet-shaped charcoal fueled smoker is the best in its category and comes in two sizes: 18.5 inches and 22.5 inches. These two are extremely popular and have been known to win Grand Championships around the world against large commercial smokers. 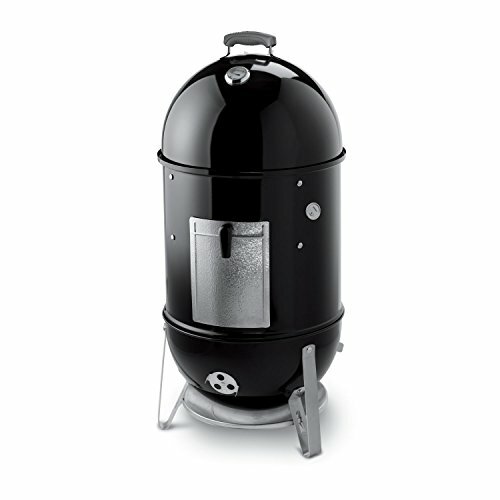 So, what is it about this smoker that there are fan sites and groups dedicated to the awesomeness of the WSM? Let’s go check out the good points. the side access door is a bit flimsy, leaking smoke and letting in oxygen. Requires a bit of “customizing” in order to fit better. The Weber Smokey Mountain Cooker certainly isn’t perfect. But there’s no question that the flaws are negligible compared to the mouthwatering, fall-off-the-bone ribs you’ll be cooking with minimum effort.